In Harmony News: The Celery Juice Explosion! Are You a Believer? The Celery Juice Explosion! Are You a Believer? Have you heard about the recent "craze" of celery juice in the morning? Is it "crazy" or a health booster you might look into? We here at In Harmony keep our feelers out for alternative healing modalities that are easy to incorporate into your life, economical, and, better yet, effective. The unsung celery bunch, used as an undertone addition to stir fries and soups, has risen to a new place of respect in the healing world. Compliments of Anthony William, The Medical Medium, the health benefits of celery juice have been expanded and explained in a new light. I will highlight some of these potent properties. Celery juice is has powerful anti-inflammatory properties. People who suffer with chronic and mystery illnesses including Hashimoto's thyroiditis, rheumatoid arthritis, fibromyalgia, IBS, psoriasis, acne, GERD, vertigo, restless leg, bloating, tingles, numbness....all can benefit from daily celery juice intake. The mineral salts in celery juice act together as an antiseptic, breaking down the cell membranes of viruses and bacteria, thus eventually destroying them. With the rising knowledge that pathogenic activity is responsible for chronic illnesses, celery juice consumption is paramount. The mineral salts in celery accomplish other marvelous things....balance our pH, aid in digestion, and are building blocks for neurotransmitters thus supporting the central nervous system. We hold a lot of negative emotion in our guts. By restoring the health of our entire digestive system, celery juice can calm our mind and hearts too. 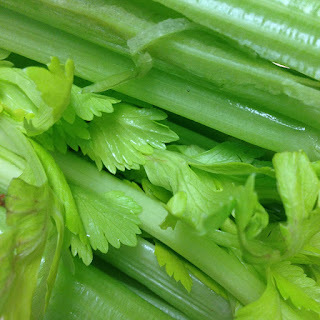 Thus, mental, physical, spiritual, and emotional health is enhanced through the humble celery. Bottom line, celery juice is alkalizing, enzyme-rich, electrolyte-enhancing, liver-repairing, blood-sugar-balancing, antiseptic, and more. Is this a miracle juice, or what! Drink 16 ounces of celery juice every morning on an empty stomach. Wait at least 15-20 minutes before consuming anything else. If you are sensitive and 16 ounces is too much, start with a smaller amount. Use organic celery when possible. If using regular celery, wash especially well before juicing. If the taste of straight celery juice is too strong, add a little cucumber and/or apple to the mix. The effectiveness is diminished, so work yourself up to drinking the juice straight. It's simple enough: 1 bunch organic celery. Rinse and run through the juicer. Alternative, if you haven't got a juice. Use a high-speed blender and blend until smooth. Strain well, and drink immediately. Bon Appetit! And of course, FOR YOUR HEALTH! Infrared Saunas Are More Than a Place to Sweat!!! Organic Labeling...Not What You Think It Means!! !